As the earliest adopter of Microsoft products, Microsoft IT began deploying Microsoft Office 365 across the company in 2011. To optimize network capacity and performance, we took time to create and implement strategic plans for network-related technologies. We used industry-leading performance and migration approaches and adopted cloud infrastructure services to successfully move our complex global environment to Office 365. When Microsoft IT began planning its migration to cloud-based Office 365, they needed to manage and address potential network connectivity performance issues and implement thorough migration and performance planning for Office 365 services. Microsoft IT engaged in large-scale, strategic readiness efforts such as capacity analysis and network provisioning, service-specific migration optimization planning, and adoption of new cloud infrastructure services for optimized network performance in the future. After many years of investment in the on-premises network, Microsoft IT and its internal customers were accustomed to a highly reliable connectivity experience with Microsoft Office products. When Microsoft IT began planning and testing the move to cloud-based Office 365, they analyzed network infrastructure and processes to find potential performance issues before beginning the migration. This analysis was important to learn whether the existing infrastructure would support the demands of moving a large enterprise service to the cloud. And it was critical to maintaining the quality of service necessary for employee productivity in Office 365. In 2011, to test the Office 365 migration, Microsoft IT identified about 2,000 datacenter-hosted mailboxes to migrate to the cloud starting on a Friday night. At that time, Microsoft Exchange used caching to compensate for latency in mailboxes that were geographically distant from their users, and regular email synchronization to local mailboxes provided optimal performance. The initial mailbox migration was completed successfully over the weekend. On Monday morning, users logged in and their client machines began to synchronize through the Internet to the cloud all at once. The sudden demand overloaded the gateway to the Internet and caused an outage. Valuable lessons were gained from this test, which have been applied to migration planning processes since then. A key lesson was that collaboration and communication between network and migration teams, working together on more extensive modeling or smaller-scale tests, might have revealed that the infrastructure could not support a 2,000-user migration. Having tightly integrated teams that can identify issues on multiple levels is the best way to avoid migration missteps. Fortunately, the technology used during the test was slated to be replaced by new technology that could support the traffic and significantly increase bandwidth. This test experience accelerated that replacement and eventually allowed for successful continued mailbox migration. Predictive modeling and small-scale experiments can highlight issues that need to be addressed. Communication and collaboration between network and migration staff is key. The Exchange cloud migration experiment was the foundation for a broad, ongoing cloud performance initiative. An essential first step was to closely engage the network and infrastructure teams, who could identify the tools and strategies necessary for a major migration from on-premises servers to the cloud and allow Microsoft to take full advantage of the benefits of cloud services. Traditional on-premises server systems, despite lacking the scalability of the cloud, had one advantage: network connectivity had been optimized and provisioned over many years, and any bottlenecks had been addressed. Before moving to Office 365, Microsoft used remote datacenters for many user locations. And, like most IT organizations, Microsoft IT already had experience with explicit planning for network capacity, beyond simply laying the largest available cable between users and servers. For Microsoft IT to maintain the performance that users expect while migrating powerful applications such as SharePoint and Exchange to their cloud-based versions, it needed to ensure availability and connectivity. Planning for testing for appropriate network connectivity to the cloud. Implementing thorough migration and performance planning for services such as SharePoint Online and Skype for Business Online. Embracing new cloud infrastructure services such as ExpressRoute for Office 365. When using Office 365 cloud services, Internet infrastructure that supports connectivity and bandwidth must be designed to meet the demands of the cloud service. When Microsoft IT began large-scale migration to Office 365, readiness efforts included performing high-level capacity analyses, adding redundancy to ensure Internet availability, and optimizing connectivity for all users. And each Office 365 service presented unique migration challenges that had to be considered and planned for. SharePoint Online and Skype for Business are two examples of the diversity of the performance optimization experiences, efforts made, and lessons learned as part of the Office 365 migration. Microsoft IT continues to serve as the company's first and best customer today, piloting new cloud solutions that will offer even better network performance for Office services in the future. Teams within Microsoft IT make broad and continual performance optimization efforts across the Office 365 suite of applications to enable a high level of employee productivity during and after migrations. These efforts include performing capacity planning calculations, providing redundancy and resiliency where appropriate, and creating the shortest path possible between the client and the cloud. To prepare for migration, IT teams need to analyze capacity, add redundancy, ensure Internet availability, and optimize connectivity for all users. Enterprise employees place many demands on a network. Information workers, salespeople, and engineers all have different network utilization patterns and productivity needs. When Microsoft IT is preparing to bring a new site online or relocate a team, a carrier services manager uses a generalized calculation to determine how much service a given location will need. For example, capacity guidelines within Microsoft IT were formerly 110 Kbps per sales person and 300 Kbps per developer. As services have become data-hungry and teams have become more widely dispersed, the typical user—regardless of job function—is now estimated to use about 400 Kbps of bandwidth during normal activity. Although this is a subjective guideline that may be affected by many factors (concentration of users, size of campus, remote access, non-user access, and so on), it is a practical starting point. Estimating initial capacity will ultimately reduce the level of investment needed to provide an acceptable level of service and satisfy business needs at that location. Microsoft IT has a policy to deploy an Internet edge stamp that can sustain the expected capacity demand for the next 18 months. The design can scale to double the capacity during the useful life of the hardware, which is typically three to five years. This relatively simple and affordable policy provides the advantage of being able to size the circuit (which may be owned by an external provider) up or down as needed when a team moves or its size changes. Provisioning in this manner is much easier and less expensive than deploying more equipment and increasing the size of the edge later. This practice provides a great degree of agility as well as the ability to optimize connectivity for both cost and performance, with minimal complexity and low risk of outages. By investing in thorough migration preparation, Microsoft IT has seen a positive effect on the speed of the migration, availability of the service, and quality of the user experience. When planning for Office 365 migration, Microsoft IT recommends investing the time to create profiles, calculate capacity needs, and build the network out in anticipation of these needs. Office 365 has published capacity-planning tools to help customers size their own bandwidth needs (see the Resources section). Investing time to create user profiles and associated usage estimates by role can help with planning for network capacity needs. Deploying an Internet edge stamp that can scale to double the expected capacity during the life of the hardware can provide flexibility, optimized connectivity, and long-term cost savings. In locations where Internet connectivity is critical, such as operations centers where employees must work on site with no option for remote work, Microsoft IT introduced circuit redundancy by providing more than one physical connection to the site via different carriers. If one carrier service fails, a secondary carrier can provide backup service. This redundancy is critical in business climates that rely heavily on cloud productivity services like Office 365, and where Internet connection failures result in reduced employee efficiency. Microsoft IT also uses global network redundancies for alternative routing in case of disaster. This strategy was tested in 2011, when a 9.0-magnitude earthquake and subsequent tsunami in Japan brought down power and severed network connections with the west coast of the United States for several days. The existing network redundancy allowed Microsoft IT to route around the severed connection to reach other worldwide destinations through unaffected redundant regional connections. Most enterprise networks were not built to optimize the flow of traffic from local intranets to services on the Internet. In many IT organizations, intranet performance is still prioritized over Internet performance. For large organizations planning a migration to Office 365 cloud services, a prioritized focus on Internet performance and availability, with increased emphasis on Internet connectivity and redundancy, is important to a successful transition. Optimizing for worst-case scenarios by planning circuit redundancy can reduce the impact of unexpected outages. Prioritizing Internet performance as highly as intranet performance is a critical aspect of planning for cloud migrations. As the suite of Office related services expanded and were more heavily used for productivity purposes by their employee base, Microsoft IT did a networking “reality check,” comparing connectivity methods based on user location. This process involved closely examining the data traffic patterns of Exchange and SharePoint services. Although the traffic patterns varied significantly with each service, the fundamental connectivity optimization made by Microsoft IT improved network performance across each service and improved overall user productivity. During this optimization effort, Microsoft employees in major campuses and large office buildings were connected through the corporate intranet, which has reliable and robust private networking. This worked well for on-site employees; however, remote employees in home offices or mobile locations who needed to connect to these productivity services had to follow a much less efficient path. These employees connected from the Internet (via on-demand remote access for home users or persistent site-to-site VPN for remote users) through an inbound corporate edge. They would then route from their connectivity point through the intranet to the datacenter. Around this same time, Microsoft IT began working with the Office product team to enable broader access to their services to support new work styles and flexibility in client devices. This involved publishing their services securely to the Internet in a model that was a precursor to consuming these services from the public cloud. As shown in Figure 2, home office and remote clients access the Internet and connect to Internet-facing service endpoints to reach on-premises services. The endpoints are presented by load balancers that scale out the web services, and a DMZ network securely publishes the services and data to the Internet. Similarly, smaller Microsoft branch offices (Internet-connected clients) previously connected to the corporate intranet via a leased line or a persistent VPN, so their local connectivity was an extension of the corporate intranet, with no on-site edge. This was a suboptimal experience for users accessing Internet-based Office services. For example, the closest hub to a sales office in New York might be in North Carolina; to reach the Internet, traffic would first have to travel from New York to the corporate intranet in North Carolina. Microsoft IT improved connectivity in such situations by creating an Internet edge at these branch sites, which gave them direct Internet access. To further increase the efficiency and improve the user experience, Microsoft IT allowed users to use Internet path even if they were simultaneously connected to the intranet via VPN or other remote access solutions. This was accomplished via a “split tunneling” configuration. All of these measures set up a client connectivity model that was ready for the move to the Internet-delivered public cloud service that is Office 365. Additionally, such direct paths to the Internet typically required advanced data loss prevention measures. This usually involved integrating advanced client security protection, such as antivirus and antimalware safeguards, Windows Firewall, and a firewall at the Internet edge. Before migrating to Office 365, Microsoft IT had to examine all data as it left the internal network. With Office 365, however, the destination cloud services scan and analyze files to determine whether they violate any policies, and traffic can safely travel, for example, from a home office to the Internet to the service without the added security measure of sending it through the managed edge. Analyzing and planning for user edge traffic patterns and implementing connectivity that shortens the path to the Internet possible can improve cloud-based network performance. Security and compliance functions delivered as part of the cloud service can reduce or eliminate the need to provide these functions on the network path, reducing complexity and cost without sacrificing quality and security of the connectivity solution. Microsoft IT focused its performance optimization efforts for SharePoint Online on two major areas: a gradual, staged migration plan that mitigated most impacts of migration on performance, and a SharePoint portal performance analysis that led to important configuration optimizations in caching, content rendering, and navigation. Because of these efforts, Microsoft IT enjoyed an especially smooth migration of SharePoint content and portals to Office 365. When Microsoft IT began migrating to SharePoint Online, there were approximately 70,000 site collections and over 100,000 My Site personal sites. 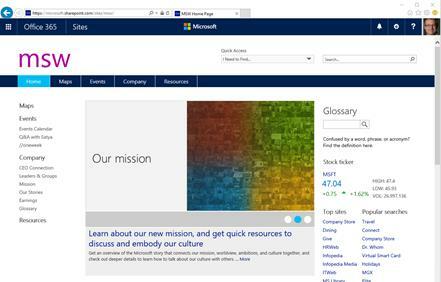 Through a combination of cleanup efforts and a “Start Fresh” approach, (see below for a full description) to encourage net-new adoption, Microsoft IT was able to reduce the actual number of site collections that had to be fully migrated to 22,063 Team Sites. These sites consisted of 36 terabytes of data, and were approximately a 50 percent reduction in sites to be migrated (this did not include self-migrations of Team Sites or My Sites, which were primarily content-only moves). After the Start Fresh adoption and cleanup efforts were completed, the team successfully migrated more than 97 percent of its relevant SharePoint sites to the cloud in less than one year. Part of this success is attributable to the development of new SharePoint Online migration APIs (currently in preview; see Resources) coupled with a third-party tool developed by Metavis, which greatly improved throughput for migration throughout the year. Microsoft IT also treated the migration as a large-scale project, complete with project management assignments, a detailed communication plan, a rollback plan, and buy-in from all stakeholders. Most importantly, Microsoft IT planned and performed migrations in a staged manner that greatly minimized impact on performance. The most important step to prepare for migrating to SharePoint Online is to perform a detailed audit and to clearly understand your environment. Determine which sites have not been edited for some time and reach out to the site owners to find out if they are still needed. Remove those that are not needed any longer. This cleanup is essential to make sure you are only migrating the most relevant data. Start Fresh. Individuals and teams were encouraged to create new sites in the cloud and manually migrate their own content as needed, only moving the most important files and discarding the rest. Forklift. Microsoft IT performed a bulk migration of nearly 30,000 high-value SharePoint sites, using third-party migration tools. Partial Move. Select content was moved to the cloud, and more complex content (such as content for highly customized portal components) remained on-premises until it could be redesigned. Redesign. Some portals with highly customized applications and solutions were slated for complete redesign, with custom workload migration and completely rebuilt solutions to take advantage of newly available technology, such as Azure media services, and to leverage the new app model. Performing migrations according to site categories is essential to efficient SharePoint migration. Although all four approaches were instrumental in the successful Microsoft IT SharePoint migration and can serve as a model for any IT department planning a migration to SharePoint Online, the Start Fresh approach was perhaps the most significant for mitigating potential migration-related performance issues. This approach involved regular communication and a generous timeline, allowing users to self-migrate at their convenience. To simplify the transition and encourage users to move, Microsoft IT created a process by which users could create a new SkyDrive Pro (now OneDrive for Business) site on first visit by simply clicking a link. Additionally, end-users were informed that their on-premises My Sites would eventually be eliminated. Within a specified time (approximately one year), users could migrate critical content on their own and discard anything no longer needed. Microsoft IT did not migrate any content from My Sites on-premises to SkyDrive Pro. For more complex sites requiring third-party migration tools, users could request migration assistance from Microsoft IT in the form of forklift moves, partial moves, and redesigns. Establishing a project plan and using a third-party tool (Metavis) that takes advantage of the migration APIs developed by the SharePoint product group can reduce the overall impact of migration on performance. As users moved to their new sites and experienced the benefits of cloud document storage and accessibility firsthand, SkyDrive Pro experienced viral adoption. Growth in use of SharePoint Online in Microsoft IT was organic and gradual, but also highly efficient and effective. A year after the start of the SharePoint migration in Microsoft IT, more than half of its SharePoint footprint was in the cloud. This gradual onboarding and adoption approach is ideal for organizations that can increase network bandwidth as needed over time. Although a large migration to Office 365 ultimately requires some increase in network capacity, very little upfront network load planning is necessary in a long-term migration model. This approach minimizes the effect of migration and any associated performance issues because it greatly reduces the possibility of sudden changes in throughput or network capacity. A gradual approach to SharePoint site migration that provides a generous timeline for more user control can minimize the effect of migration on network performance. For on-premises SharePoint portals whose size and complexity require a complete redesign for optimal migration to Office 365, portal performance in the cloud may be affected by conditions that did not exist in on-premises environments. The recent migration and major redesign of the Microsoft internal employee portal, MSW, offers a real-world illustration of these challenges. For example, when the new MSW portal first went into testing on Office 365 with the same web parts from on-premises, pages took about 20 seconds to load—too long. Microsoft IT discovered that half of this delay was caused by navigation issues, and the other half was caused by content query work. (There were over seven content query web parts on the portal’s home page when initial testing began.) The page loading issue was quickly determined to be caused by expensive server-side rendering that did not benefit from the same cache profiles on Office 365 that existed on-premises. It was resolved by switching to metadata-managed navigation and using the new Content Search Web Part. Any large portal redesign in SharePoint Online requires performance tuning. A few of the performance considerations for the MSW portal redesign are highlighted in the following paragraphs. Many more considerations for page-loading optimization can be found in the article Tune SharePoint Online performance (see the Resources section). Caching. Moving portals to Office 365 involves transitioning from an on-premises model with a few dedicated machines hosting an entire service to a shared, multi-tenant model with many machines hosting many workloads. When MSW was hosted on-premises, four front-end servers were dedicated to handling user requests. Generally, those servers all had MSW in cache, so users experienced good performance. SharePoint Online, however, uses orders of magnitude more front-end servers shared across all workloads and sites within the customer’s tenancy. The cache is also shared across many customers with different data to cache, so any cache is short-lived on any particular front-end server and is less likely to contain the specific desired portal pages. Relying on object caching was, therefore, not an effective way to ensure an optimized user experience for MSW in SharePoint Online. Microsoft recommends avoiding dependency on SharePoint Online front-end server caches by using other approaches to performance optimization that do not rely on object caching, including use of the Content Search Web Part and metadata-managed navigation. Content Search Web Part. In the on-premises implementation, MSW used the Content Query Web Part (CQWP) to write dynamically rendered content. However, with the reduced dependency on caching in Office 365 came reduced performance with use of the CQWP. Any server-side work that was necessary to generate a page would not be cached, causing a performance decrease in Office 365. To restore performance, MSW replaced the CQWP with the Content Search Web Part (CSWP), to quickly deliver results to the user by retrieving and rendering data independently of the server. Using the CSWP resulted in significantly better page loading performance in SharePoint Online and was a major factor in making the portal responsive in the cloud. Navigation. Because caching should not be used in a shared front-end server model, structural navigation can be problematic for complex site structures in Office 365. When MSW was migrated to the cloud, it initially retained the structural navigation of its on-premises implementation. It quickly became apparent that this was affecting performance due to reliance on front-end server caching. Because MSW did not require navigation security trimming (the ability to hide navigational links to restricted files), Microsoft IT decided to switch to managed navigation, which provided a substantial performance benefit in SharePoint Online. Office 365 offers three navigation choices: structural, managed, and search-driven. If security trimming is required and the site has a simple structure, structural navigation is still a viable option. For sites that require security trimming and have a more complex structure, search-driven navigation (which requires customization of the master page but provides a fast load time and locally cached navigation structure) may be considered. Simply put, choosing the appropriate navigation option for the needs of the site can greatly improve site performance. Search-driven design user interfaces and navigation tuning efforts can mitigate performance implications of the change in caching behavior with shared servers. Search performance can be optimized by using the Content Search Web Part. When Microsoft IT began its transition to Office 365, the team responsible for Lync and Skype for Business services was already involved with a major performance improvement effort as part of the transition from Lync to Skype for Business. This work included categorizing service challenges and large-scale, long-term planning for improved performance and availability both on-premises and in the cloud. This improvement project expanded to include an intense evaluation of the cloud management service and strategic work to prepare the network environment and optimize for the cloud, as well as a cloud migration plan that took advantage of flexible hybrid opportunities. Knowing that a Skype for Business cloud migration would require changes to the network environment for optimal performance, Microsoft IT took advantage of the Microsoft Click-to-Run technology to reduce complexity and IT overhead, allowing Office 365 to manage Office and Skype for Business client updates. By moving to the cloud, Microsoft IT was able to manage updates and ensure the most current versions of the client at all times, guaranteeing availability of the newest features and the greatest reliability. They analyzed federated traffic with external organizations in a hybrid environment to prevent potential bottlenecks at the network edge. They developed a deep understanding of the traffic flows within the network to optimize routes for voice traffic. They ensured that their private connectivity, which reduced complexity in the network integration for Skype for Business in Office 365, had the appropriate markings for quality of service and guaranteed prioritization to the Office 365 network. Historically, major IT investments have included tools, systems, and personnel for managing infrastructure and applications; moving to the cloud shifted some of those burdens to Office 365 and enabled Microsoft IT to focus more resources on adoption and improving control over the Skype for Business user experience. Microsoft IT has seen fewer incidents caused by network changes, because dedicated network links now connect users directly to server farms in the cloud. In Office 365, the risk of user or service impact caused by internal network changes or configuration drift is greatly reduced. Migrating Skype for Business Server to Skype for Business Online in Office 365 may allow IT departments to shift resources from internal IT infrastructure and applications to adoption efforts and a more managed user experience. Because of the real-time nature of the Skype for Business service, optimizing performance is even more critical than with other Office 365 services; even a few seconds of lost voice, video, or data affect user productivity. Therefore, before Microsoft IT could migrate Skype for Business to the cloud, it was crucial to evaluate change and develop new strategies for availability, reliability, and performance. When Microsoft IT began to transition Skype for Business to the cloud, the existing wireless networks were optimized for data, but not for real-time communications such as voice. With the increase in the number and variety of mobile devices in the workplace, use of wireless connections more than doubled during meetings in less than a year. Additionally, transitioning to open floor plans to reduce physical footprints and accommodate new working models resulted in increased user density and additional meeting spaces. To accommodate channel overlap and improve signal optimization in this changing wireless environment, Microsoft IT re-tuned their wireless access point placements and deployment configurations based on analysis of changing user behaviors, varied user density, and new floor plan trends. At the same time, Microsoft IT was seeing widespread increase in Windows 8 machines that were optimized for Wireless N network hardware rather than wired connections. Microsoft IT standardized the environment for wireless N, ensuring clear communications by proactively making sure that its wireless network drivers were as current as possible and continuing to actively push driver updates. The increasing popularity of mobile devices and open floorplans in the workplace requires analysis and potential redesign of network configurations, as well as increased focus on driver updates. The Microsoft IT Skype for Business migration to the cloud is occurring in phases. Even more complex than the SharePoint migration, the Skype for Business migration to Office 365 is part of a much larger deployment that also includes the launch of Skype for Business Server 2015 and the new Skype for Business client software. The Microsoft IT ecosystem for Skype for Business involves 218,000 users in both on-premises and Office 365 environments; of these, 30,000 are currently in the cloud, producing 3.5 million streams per month. This hybrid environment allows Microsoft IT to provide global public switched telephone network (PSTN) connectivity for both Skype for Business Server and Skype for Business Online while optimizing performance and the user experience. Processes and applications are moved into the public cloud environment as quickly as possible. Microsoft IT currently provides global enterprise voice in the cloud and will remain in a hybrid configuration until global services are available online. There is high user satisfaction with the current hybrid environment; a cloud user and an on-premises user can have a seamless conference in a shared environment without any awareness of its hybrid nature. Office 365 implementations will vary greatly by organization, with some small organizations moving easily to a total cloud environment and larger organizations using longer-term hybrid scenarios. Like Microsoft IT, other large IT departments may experience challenges that will influence performance planning for Skype for Business migration, such as application requirements, telecommunications investments, carrier limitations, partner dependencies, and number of users. Fortunately, the flexibility of gradual hybrid deployments can mitigate many of these challenges. A gradual hybrid transition to Office 365 allows companies to migrate to the cloud while continuing to maximize their investment in their existing on-premises telephony equipment. Until now, Microsoft IT has used Internet-based connectivity to Office 365 public services, working with network transport providers and carefully selecting the regional locations of the tenancy to improve the network experience. 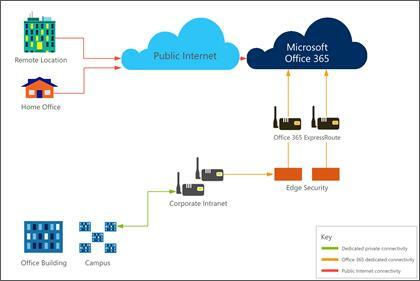 The current phase in Office 365 connectivity involves shifting connectivity from a standard public Internet connection to private peering using Microsoft ExpressRoute for Office 365, the same technology used for Microsoft Azure. ExpressRoute provides Microsoft IT with private network connectivity that offers performance that is more predictable and guaranteed service availability. A standard public Internet connection is an uncertain and unpredictable network path in which service quality depends on carriers, traffic, intermediaries, and proximity to cloud datacenters. With ExpressRoute, organizations contract with a Microsoft partner who is a network service provider or an Exchange provider. These companies provide connectivity into the Microsoft network, which connects all Microsoft datacenters, offering predictable performance, data privacy, and guaranteed service availability. Although ExpressRoute is being used by Microsoft IT, ExpressRoute is not required or recommended for Office 365 customers except in a small number of situations. These situations include a) regulatory requirements that would mandate a direct network connection or b) following a required customer network assessment for Skype for Business voice and video when network deficiencies are discovered that ExpressRoute can address. In the situations where ExpressRoute for Office 365 is implemented, Microsoft should be directly involved to ensure a successful implementation. Figure 4 illustrates using ExpressRoute with Office 365 and the corporate intranet. 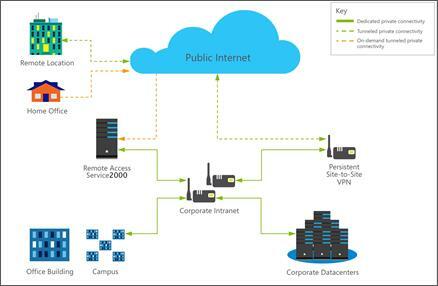 Using private network connections with Azure ExpressRoute for Office 365 is a practical solution that may help enterprises address any performance uncertainties of an Internet-connected network path. Plan for Internet capacity requirements before migration. Migrate one Office 365 service at a time. Treat your Internet network connection as critically as you would treat your network connection to on-premises datacenters. Deploy an Internet edge stamp that can scale to double the expected capacity during the life of the hardware. Plan for pilot testing, troubleshooting, and optimization. Use migration as an opportunity to carefully evaluate and prioritize what should be migrated. Mitigate risks by not migrating lower priority data. Assess on-premises SharePoint page navigation models that rely on caching for performance and evaluate the appropriate navigation model for optimization. Use hybrid environments where appropriate to manage migration. Use private network connections with Azure ExpressRoute for Office 365 to address the performance uncertainties of an Internet-connected network path. Microsoft IT has been planning and carrying out Office 365 migrations since 2011, and the stories shared here are just a few examples of the achievements made and lessons learned along the way. Together, these experiences support a single, essential message: investing the time and effort necessary to implement thorough and strategic planning for network connectivity results in fewer migration complications and better overall performance. Of course, IT organizations will inevitably need to perform some degree of additional optimization and troubleshooting work before, during, or after migration. Guidance is available for performance optimization and troubleshooting for all phases of Office 365 migration (see the Resources section).